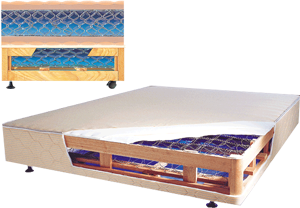 Rollaway Beds The Slumberland rollaway bed consists of a normal set of Slumberland Institutional Series of mattress and divan and a specially made headboard which has castors for easy transportation. ● PILLOWS Slumberland pillows contain 100% hollow siliconized polyester inner-filling which is light in weight, washable and luxuriously resilient. The cover fabric is made of 100% high quality cotton. ● BOLSTERS Bolsters contain 100% hollow siliconized polyester inner-filling. The fabric cover is also made of 100% high-quality cotton. 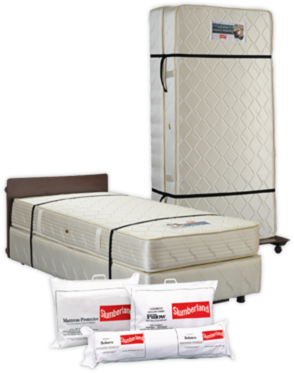 ● MATTRESS PROTECTORS The Slumberland Mattress Protector can add years to the life of your mattress by keeping it clean and free from stains. The 100% high quality cotton cover gives extra durability. It is filled with 100% hollow siliconized polyester so it is light, soft and washable. Four elastic anchor bands are provided at the corners for a snug fit. Upholstery Layers ● Felt Pad ● PU Foam ● Wooden Frame Made Of Tropical Hardwoodwashable. Copyright © 2019 Slumberland All Right Reserved.